Yes, I’m home from the Bahamas! I arrived in Kansas City Sunday afternoon. Ray and Leah picked me up at the airport, and we went out for some delicious Indian food that Ray wanted, then I went home and crashed in bed. Ray and Leah had even cleaned most of the house for me, which was such a blessing! The last two days, I’ve been unpacking, resting, and today I dusted, vacuumed, and organized my office. It was an incredible, exciting trip, for which I’m very thankful to God and Tony Robinson and her Well Watered Ministry staff. Oh, I can’t wait to tell you all about it! 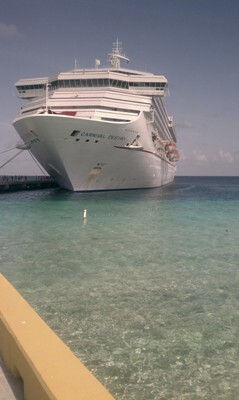 Yes, that is the HUGE ship I was on ~ Carnival Destiny. The name of the ship was significant and prophetic, and inspired what I spoke about, as well as what Tony shared. The water is blue-green and clear, and feels SO good swimming in it – just beautiful. I will share more with you later. I’m about to cook dinner, and then am working on several things tonight…slowly getting back into the “groove”. I can’t wait to tell you more and share pics and videos with you – so hang on! 🙂 And thank you so much for your prayers. I’ve missed you! And I’ve missed you! Cannot wait to hear ALL ABOUT IT!! !